I've been backpacking for over 30 years, all over California, Minnesota, and many western states. 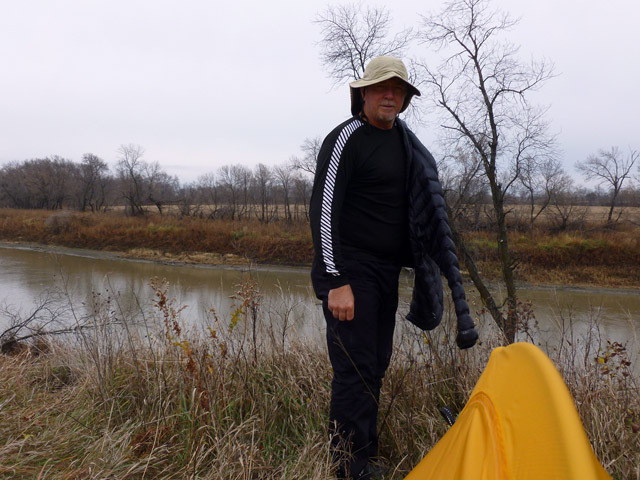 I hike year-round in all weather, and average 500+ miles (800+ km) per year. I make a point of using lightweight gear, and smaller volume packs. 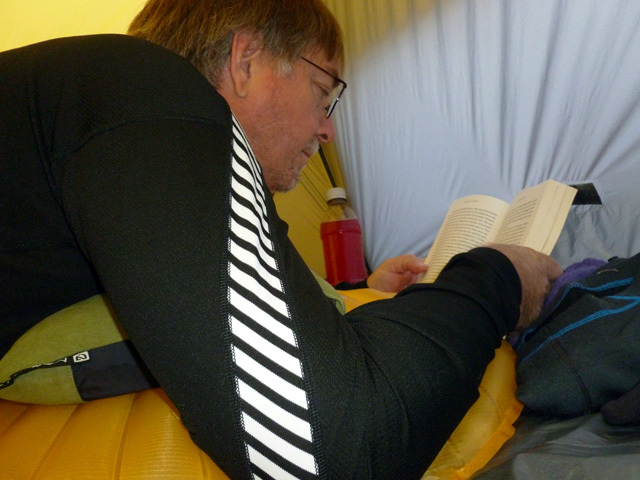 Doubting I can ever be truly ultralight, I try to be as light as I can yet still be comfortable. I start early and hike hard so as to enjoy the afternoons exploring/chilling. I usually take a freestanding tent and enjoy hot evening meals. If not hiking solo I am usually with my brother-in-law Dave or my twin children. 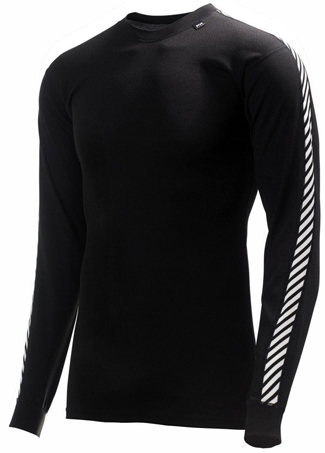 The Helly Hansen Dry Stripe Crew is the first synthetic baselayer I have ever owned that does not have an odor-control problem and for that reason alone is enough to make me like it a lot. Add to that a very low weight and decent warmth for a light baselayer and it just gets better. Please read on for the details. The Helly Hansen HH Dry Stripe Crew (hereafter referred to as the Dry Stripe or shirt) is a lightweight baselayer made for all-season use. The shirt is made of polypropylene, Helly Hansen calls theirs Lifa. The company makes baselayers with the "Dry" designation along with a series called "Warm". From what I can tell all Dry garments are made with Lifa that comes in at 125 g/m2 (3.7 oz/y2) putting them in the light-weight category, as opposed to the mid-weight range of their Warm garments. The Lifa is woven in a very open pattern. When held up to the light it almost looks like more of a mesh than a solid fabric. This is on purpose as the thicker spots contact the skin and pull moisture away from it while the more open areas allow the moisture to evaporate faster. This pattern of weave covers the entire shirt with the exception of the band of white stripes running down each arm from shoulder to wrist. That band serves a purpose more than just looks as the flatlock seams sit on either side of my shoulder, keeping it from being a spot of agitation when I am carrying a heavy pack. All of the seams on the shirt are sewn with the flatlock style. The collar and cuffs are made with a tight weave with a lot of elastic in it to allow it to stretch. Inside the collar is a sizing and care tag that I immediately cut out. ;-) Another small tag on the outside/front/left has the Helly Hansen H/H logo on it. I got the HH Dry Stripe Crew at the beginning of August and took it on every single hike until it got too cold in November. 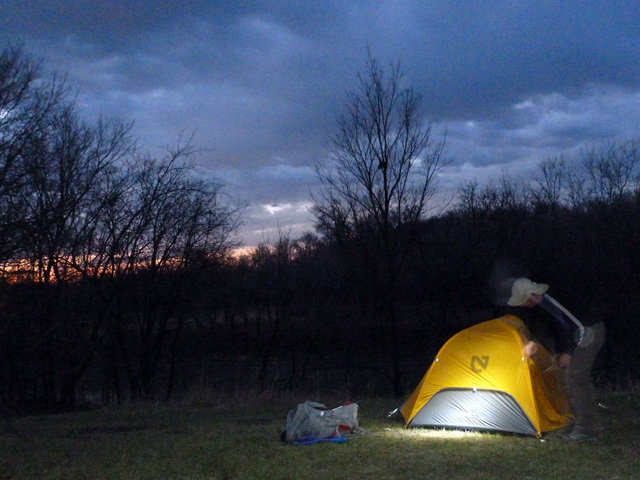 This included two days in North Dakota at Theodore Roosevelt National Park and Sully Creek State Park. One day saw rain, and temps ran from 99 to 50 F (37 to 10 C). 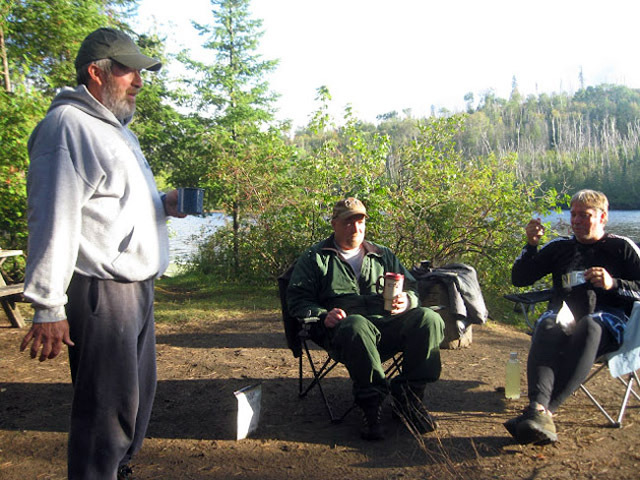 Next was a five-day trip deep in the Superior National Forest, right by the Canadian border. I volunteered to help the United States Forest Service (USFS) build a bridge over Bridal Falls on the Gunflint Trail. The temperatures on this trip were from 35 to 70 F (2 to 21 C). The weather was pretty bad, it rained on three of the days off and on. The picture above, taken at dinnertime after the sun came out finally, sees me having to wear my baselayers as my clothes were soaked (as were everybody else's). At the end of September I took it on a long California trip that saw a 2-day backpacking trip in the southern Sierra Nevada, and 5-day backpacking trip in the northern Sierra Nevada, and a day-hike and 2-day trip in the Angeles National Forest. There was a total of 136.5 miles (220 km) with 23575 ft (7186 m) of gain, in temps that ran from 31 to a ridiculously warm for that time of year 90 F (-1 to 32 C). Almost all of it was on the Pacific Crest Trail (PCT). I have to say right off the bat that I have not bought a polypropylene baselayer in decades and the ones I have gotten for free I give or throw away soon after getting them. Why? Because the ones I did get have all been horrible at controlling odor. It did not matter what brand I got they would retain body odor, some even after washing. Finally I just gave up and only bought, or agreed to test, fabrics that used some form of antimicrobial treatment, like silver, or blending with wool. Even the 100% synthetics I tried with an applied (wash-in) antimicrobial did not work well enough to make me keep the garments. So it was with some reluctance that I tried the Dry Crew. Needless to say (since I am reviewing it) I worried about nothing. This is the first 100% synthetic shirt I have used that didn't hold odors. Kudos to the folks at Helley Hansen. Now I rarely hike in my long baselayers. I mainly use them at the end of the day after I make camp and wash the sweat and dirt off myself. Once I am somewhat clean I do not like to reapply bug repellent so I always put my long sleeve shirt on then. I also keep it on once I hit the sack, be it quilt or sleeping bag, to help keep it free of body oils or sweat. It makes great "pajamas" to lounge around in too, as I am here, being stuck inside during a rain storm. On cold mornings I will sometimes start out hiking with my long-sleeve shirt on, but remove it as soon as I start warming up, usually within 30 minutes. So I never really got the Dry Stripe stinking filthy, but don't with any long-sleeve shirt for 3-season hiking as I only use short sleeve t-shirts as a rule. The last two hikes I used it on I did wear it to hike back out the second day as it was cold enough to just leave it on, but the low temps kept me from sweating too much. As Helly Hansen makes this in a short-sleeve tee also maybe next summer I will try one and see how it handles me at my dirty worst. I was very surprised at the weight of the shirt. In looking back on years of archived reviews I see only two long sleeved baselayers that were lighter, and even many of my short sleeved shirts are heavier than it. And it is pretty warm when it is layered with something else on top. The same mesh-like openings that help moisture evaporation also trap heat when the material is covered, much like my old mesh hiking shirts of yester-year. I was able to use just a light down sweater along with the Dry Stripe into the beginning of November as the combination provided enough warmth. Here is a shot before adding the down on the banks of the Red River. The initial construction was very good and it has held up fine so far. The neck is starting to get a few warps in it, (the dreaded bacon-neck) but that may just be proof that I have a big head. ;-) The cuffs and hem are still fine. I always machine-wash it cool, and hang it over the shower bar to dry. I have put the Dry Stripe away for the year as it is time to break out the mid-weight baselayers. But I am keeping the Helley Hansen Dry Stripe and now have a polypro shirt in the baselayer drawer again. 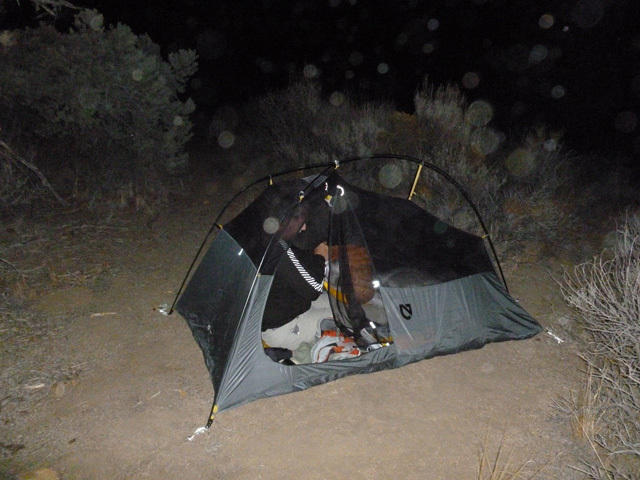 I leave with a shot packing up early in the morning on the Pacific Crest Trail. All the artifacts in the shot are from dust in the air as Dave took the picture. This report was created with the BackpackGearTest.org Report Writer Version 1.5 Copyright 2012. All rights reserved.